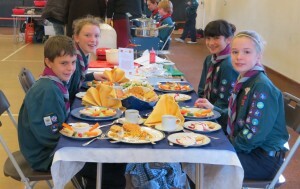 The Scout section have retained their District Trophy by winning the Cooking Competition held last weekend. Well done to Harry Wills, Ellie White, Jasmine Quartly & Alice Hodgins (a last minute replacement for Matt Harris) who produced a three course meal on a European theme, cooked on a simple two-ring gas burner and grill, and on a budget of £17! With a starter from Greece of Homemade Houmous served with sesame flatbreads and vegeltable sticks, main course of Spanish Paella with a goat’s cheese salad and Pan Con Tomate, and finishing of with Panna Cotta served with shortbread stars and raspberry coulis from Italy. This puts them through to the County Finals in February in Beer – good luck!